Follow These Precautions Carefully: To ensure safe and correct handling of the battery, read the following precautions carefully before using the battery or inspecting it. positive terminal to contact any other metal object that could cause sparks: Flames and sparks near open battery cells are dangerous. Hydrogen gas, produced during normal battery operation, could ignite and cause the battery to explode. An exploding battery can cause serious burns and injuries. When working near a battery, do not allow metal tools to contact the positive or negative terminal of the battery. including cigarettes, and sparks away from open battery cells: Flames and sparks near open battery cells are dangerous. Hydrogen gas, produced during normal battery operation, could ignite and cause the battery to explode. An exploding battery can cause serious burns and injuries. Connect the negative cable to a good ground point away from the battery: Connecting the end of the second jumper cable to the negative terminal of the discharged battery is dangerous. Route the jumper cables away from parts that will be moving: Connecting a jumper cable near or to moving parts (cooling fans, belts) is dangerous. The cable could get caught when the engine starts and cause serious injury. CAUTION Use only a 12 V booster system. You can damage a 12 V starter, ignition system, and other electrical parts beyond repair with a 24 V power supply (two 12 V batteries in series or a 24 V motor generator set). 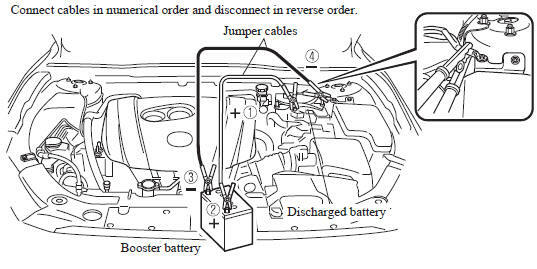 Connect the jumper cables in the exact sequence as in the illustration. Connect one end of a cable to the positive terminal on the discharged battery (1). Connect one end of the other cable to the negative terminal of the booster battery (3). (With i-ELOOP system) The i-ELOOP indicator light may flash after the engine is started. The indicator light turns off when the engine is running and the charging is completed. Make sure the i-ELOOP indicator light is turns off before driving. If the vehicle is driven with the i-ELOOP indicator light flashing, a beep sound is heard. If the steering wheel is operated with the i-ELOOP indicator light flashing, it may feel heavier than normal, however, this does not indicate a malfunction. The steering operation will return to normal when the i-ELOOP indicator light turns off. Do not remove the jumper cables while the i-ELOOP indicator light is flashing. When finished, carefully disconnect the cables in the reverse order described in the illustration. NOTE Verify that the covers are securely installed.